In History lessons, students sometimes ask whether dates are important. The instinctive response from the teacher is usually ‘yes, they are’ but, in reality, most dates escape people’s memories. The 11th November 1918 – or, rather, the 11th hour of the 11th day of the 11th month – is not one of them. For this is when the Great War, or the First World War as it came to be known, finally came to an end. And now, in 2018, we commemorate the 100th anniversary of the ceasing of hostilities, whilst not forgetting the other conflicts which scarred the last century and, tragically, the present one. 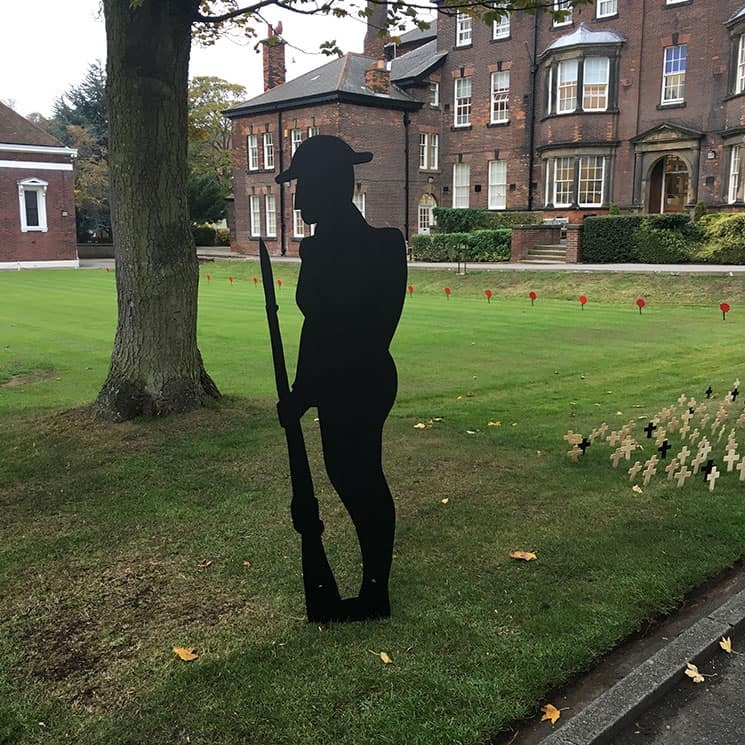 Last year, was my first Act of Remembrance at Silcoates and I was struck then by the number of former pupils and staff who were casualties within the two world wars. The loss of life was particularly pronounced in the First: 248 Silcoatians, pupils and teachers, fought in the war and 41 of these were killed (39 pupils, 2 staff). For every six who served, one was killed. This was at a time when the number of boys in the School – there were only boys at that time – numbered about 80. The impact on those left behind was therefore considerable – not least on Mr Yonge, the Headmaster at the time, who knew each of the fallen well and who carefully documented his distress, as one by one he was informed of their deaths. Such a high casualty rate was not unusual in schools such as Silcoates. Pupils from these schools were almost always put onto the front line as second lieutenants – or subalterns – on the Western Front, in which role they would be expected to lead their men if the order came to go ‘over the top’. In such a position, they would often be the first to experience enemy fire. Caricatures of such men that have appeared in films and television programmes, such as ‘Blackadder Goes Forth’, cemented the view in modern minds that such ‘public school types’ lacked brains, leadership and courage. Nothing could have been further from the truth. Indeed, their public school education taught these men the values upon which they relied: team spirit, self-reliance, stoicism in the face of adversity. For those who survived, their lives would never be the same again. Some suffered grief and hardship through the loss of or debilitating injuries to fathers, brothers, sons and friends. We can underestimate too the difficulties that returning servicemen found, coming back to a country that they scarcely recognized, picking up the threads of relationships damaged by long separations and by the unbridgeable chasm of experience. For many who served, their harrowing experience was even worse after the war ended than during it. And yet, as was revealed in the recent film by Peter Jackson – called ‘They Shall Not Grow Old’ – which has brought back to life those men and women from 100 years ago through colourising archive footage – many of those who survived had mixed feelings about the war. Whilst none denied its horrors, many had a sense that, within the darkest days of war, they discovered the best in themselves and the best in others. Stripped of all the comforts and securities of a normal existence, they understood the value of comradeship, selflessness, service, loyalty, duty and courage. How many of us do? How many of us are able to cast aside the ‘first world problems’ of today, to use the modern parlance, in order to appreciate the good fortune we have to live lives blessed by prosperity and opportunity in a country at peace? And how many of us put that realisation into practice – to go out and serve others, to put oneself second, to be a good citizen? I hope we all do – or at least intend to – but maybe today, thinking about the sacrifice made by those brave men and women we are remembering today, we can resolve to put those good intentions consistently into practice.